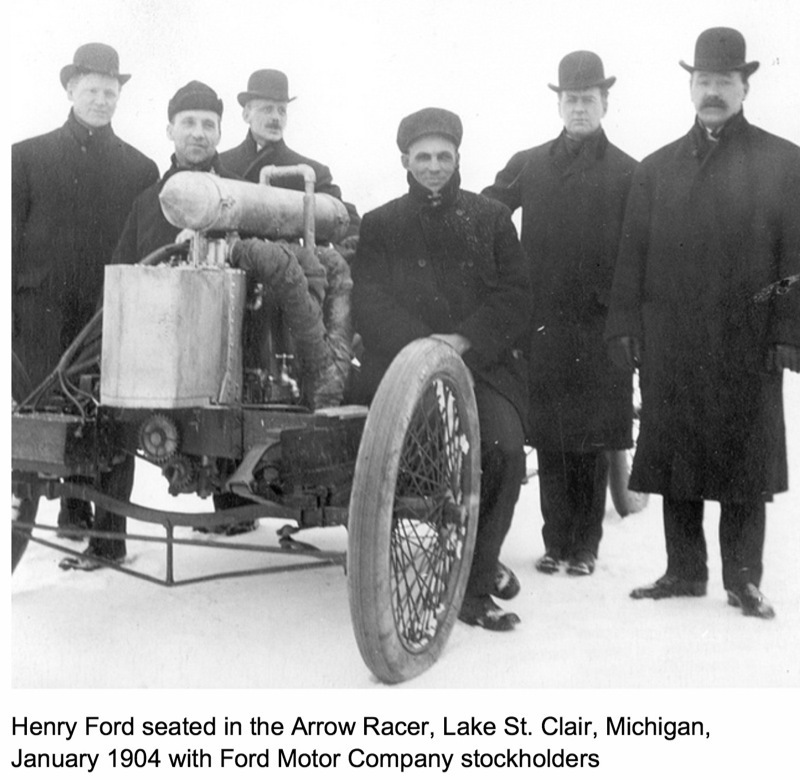 1904 Henry Ford with “999,” Lake Saint Clair. 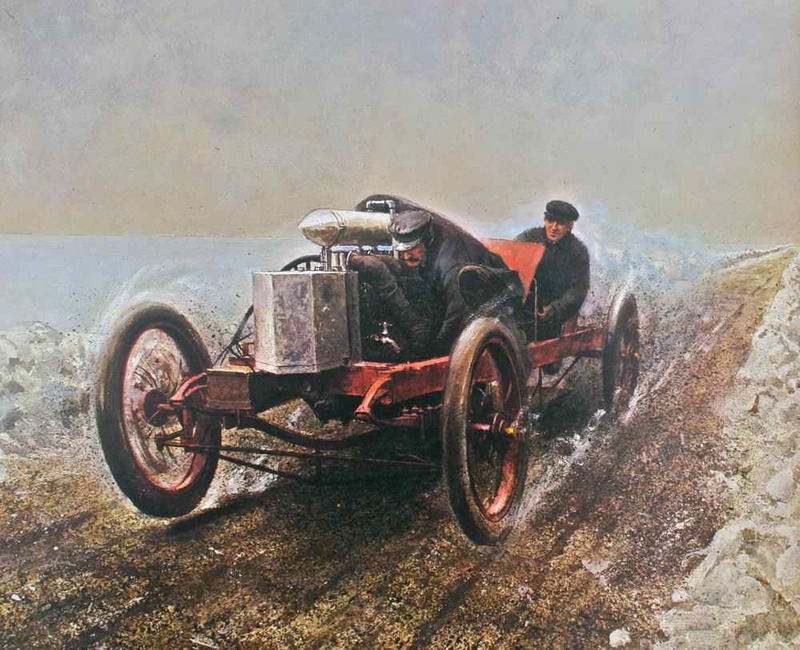 A Peter Helck painting showing Henry Ford and his mechanic Spider Huff making a speed run on January 12, 1904. Great painting! It would be a great collection if an artist would do all the Henry Ford racers? (Sweepstakes, 999, Arrow, "Baby", the two "sixes", and the Model T chassis 410 cu in Ford Special)! Are you giving a hint to Richard Eagle? So little time, so many cars. It would be a challenge but you have posted a wealth of information here. I don't believe that's the 999. It looks like it may be an Olds racer, I think. To the best of my knowledge, Ford never drove the 999 because he was afraid of it (he once said, "The roar of that car is enough to half kill a man") and that's why he hired Barney Oldfield to drive it. Marty,It's sure not the 999 that's at The Henry Ford unless lot's of changes were on going?? Bud. I think the "Henry Ford was afraid to race it" idea is another historical mistake. I have found a few occasions when Henry Ford was quoted saying he would not drive circular track races, but felt straight line races were safe. This idea is borne out in that Henry Ford drove straight line races/times when establishing the world mile record with Arrow/999, tying the 1 km record with the six cylinder racer in 1905 (broken the same day) and several other straightaway races. His most famous (and official that I'm aware of) circular track race is with Sweepstakes when he won over the Winton racer. The only other circular track result I've found with Henry Ford driving is an exhibition of the "new" six cylinder racer in Sep 1907 when he makes several mile laps with the new racer for Ford Managers at the Highland Park racetrack.